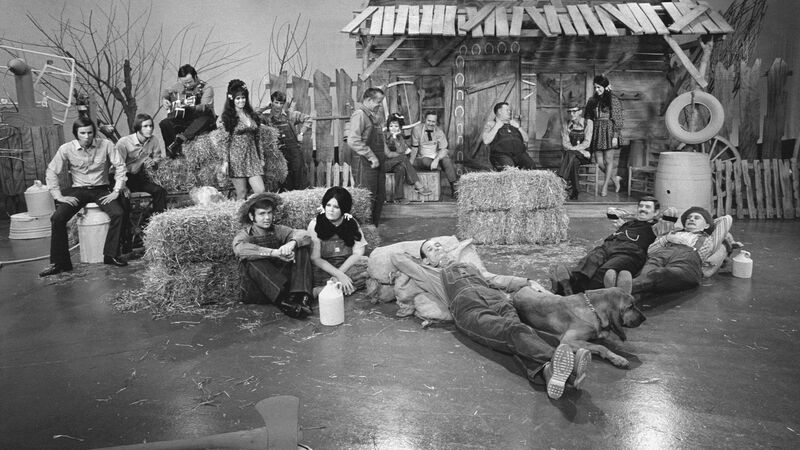 Here's where to watch every episode of Hee Haw season 2. Mouseover or tap an episode to see where to stream it. Click or tap the play icon to stream it on the best available service. Roy Rogers and Dale Evans, Bobby Bare Sep 15, 1970 Buck Owens and the whole Hee Haw gang - "Happy Times are Here Again" Roy Rogers - "The Auctioneer" Cornfield County Concert Band - "Mountain Dew" The Hagers - "Take a Letter, Maria" Dale Evans - "Country Girl" Roy Clark - "Old Joe Clark" (with a cartoon band playing their own instruments) Bobby Bare - "Detroit City" Roy Clark - "I Never Picked Cotton" Grandpa Jones - "Dooley" Roy Rogers and Dale Evans - medley: "That Old-Time Religion", "Daddy Sing Bass", and "Cowboy Camp Meeting" Buck Owens and the whole Hee Haw gang - "Hillbilly Fever"Sketches include several installments of "Dr. Campbell", "KORN News", "Gordie's General Store", and "The Culhanes". Also, "Pfft, You Was Gone", "Archie's Barbershop", "Hey Grandpa, What's for Supper? ", "Pickin' and Grinnin'", and Junior meets Sunshine Cornsilk for the first time. Charley Pride, Jeannie C. Riley Sep 22, 1970 Buck Owens and the whole Hee Haw gang - "Heartbreak Mountain" Roy Clark - "???" (playing the fiddle with a cartoon band) Jeannie C. Riley - "Duty Not Desire" The Hagers - "Who'll Stop the Rain" Charley Pride - "Piroque Joe" Jeannie C. Riley - "Holdin' On" Roy Clark - "Today" Grandpa and Ramona Jones - "Oh, Susanna" (using cowbells) Charley Pride - "I Wonder Could I Live There Any More" Buck Owens and Susan Raye - "Then Maybe I Can Get Some Sleep" Sketches include several installments of "Samuel B. Sternwheeler", "Dr. Campbell", "Cornfield Jokes", "Gordie's General Store", "Moonshiners", "The Culhanes", "Pfft, You Was Gone", and "KORN News". Also, "Hey Grandpa, What's for Supper? ", in "Archie's Barbershop", Archie tells another one of his famous "That's Good, That's Bad" stories, the Kornfield Kounty Concert band plays "Bill Bailey", and Stringbean reads a letter from home. Ray Charles, Lynn Anderson Sep 29, 1970 Buck Owens and the whole Hee Haw gang- "Stay A Little Longer" Roy Clark - "Blues in the Night" Ray Charles - "Don't Change on Me" Lynn Anderson - "Stay There Til I Get There" The Hagers - "California Cotton Fields" Roy Clark - "Thank God and Greyhound" Lynn Anderson - "Rocky Top" Grandpa Jones - "The Kickin' Mule" Ray Charles and Buck Owens - "Cryin' Time"Sketches include several installments of "Dr. Campbell", "Gordie's General Store", "Cornfield Jokes", "Moonshiners", "KORN News", "Samuel B. Sternwheeler", "The Culhanes", and "Archie's Barbershop". Also, "Pfft, You Was Gone", "Kornfield Kounty Concert Band", "Pickin' and Grinnin'" and "Hey Grandpa, What's for Supper?" George Jones, Tammy Wynette Oct 6, 1970 Buck Owens, the Hagers, Susan Raye, Buddy Alan, Don Rich and the Buckaroos - "Take Care of You for Me" Roy Clark - "Arkansas Traveler" (with a cartoon band playing along) George Jones - "Tell Me My Lying Eyes Are Wrong" Grandpa Jones - "Standing in the Depot" Tammy Wynette - "The Legend of Bonnie and Clyde" Roy Clark - "Dear Old Dixie" George Jones - "I'm a People" Buck Owens and Susan Raye - "The Great White Horse" Sketches include several installments of "Samuel B. Sternwheeler", "Cornfield Jokes", "Moonshiners", "Dr. Campbell", "Gordie's General Store", and "KORN News". Also, "Pfft, You Was Gone", "Hey Grandpa, What's for Supper? ", "Pickin' and Grinnin'", "Kornfield Kounty Concert Band", and in "Archie's Barbershop", Archie tells the story of the "Pee Little Thrigs"
Marty Robbins, Connie Eaton Oct 13, 1970 Buck Owens, the Buckaroos, the Hagers, Susan Raye and Buddy Alan Owens - "Sing a Happy Song" Marty Robbins - "I'm So Afraid of Losing You" Grandpa Jones - "You'll Make Our Shack a Mansion" Connie Eaton - "Ring of Fire" Roy Clark - "Black Sapphire" The Hagers - "Everything Is Beautiful" Marty Robbins - "Don't Worry 'Bout Me" Buck Owens and Susan Raye - "Tennessee Bird Walk"Sketches include several installments of "Gordie's General Store", "Cornfield Jokes", "Dr. Campbell", "Moonshiners", "Pfft, You Was Gone", "KORN News", "Samuel B. Sternwheeler", and "The Culhanes". Also, "Hey Grandpa, What's for Supper? ", "Pickin' and Grinnin'", and Stringbean reads a letter from home. Roy Rogers, Dale Evans and Doug Kershaw Oct 20, 1970 Buck Owens and the whole Hee Haw gang - "Y'all Come" Roy Rogers - "The Fightin' Side of Me" Doug Kershaw - "Diggy Liggy Lo" Dale Evans - "I'm A Woman" Roy Clark - "Make the World Go Away" Grandpa and Ramona Jones "When the Saints Go Marching In" (using cowbells) Doug Kershaw - "Battle of New Orleans" Roy Rogers and Dale Evans medley - "Yours, Love" and "Born to Be With You" Buck Owens - "Above and Beyond"
Sonny James and Peggy Little Oct 27, 1970 Sonny James - "My Love" Sonny James - medley: "Cold, Cold Heart," "It's Just a Matter of Time" and "Too Many Rivers." Peggy Little - "Son of a Preacher Man" Peggy Little - "I Knew You'd Be Leaving" Buck Owens - "Gotta Travel On" Buck Owens - "What You Gonna Do Now?" Roy Clark - "Sunday Morning Coming Down" Roy Clark - "Black Mountain Rally" Grandpa Jones - "Pap's Corn Liquor Still" The Hagers - "Horseflies on Your Face"
Jean Shepard and Tom T. Hall Nov 10, 1970 Tom T. Hall - "Shoeshine Man" Tom T. Hall - "The Ballad of 40 Dollars" Jean Shepard - "Seven Lonely Days" Buck Owens - "Love's Gonna Live Here" Roy Clark - "Raggedy Ann" Gunilla Hutton (Hee Haw regular making her singing debut) - "Today I Started Loving You Again" The Hagers - "Distant Drums"
Charley Pride & Susan Raye Nov 17, 1970 Charley Pride - "Me and Bobby McGee" Charley Pride - "Louisiana Man" Susan Raye - "Down in the Boondocks" Susan Raye and The Hagers - "Glory Hallelujah, How They Sing" Buck Owens - "He's Got the Whole World in His Hands" Buck Owens and Buddy Alan - "Why, Baby, Why" Roy Clark - "Lara's Theme" Grandpa Jones - "Stay in the Wagon Yard"
Tammy Wynette and Ed Bruce Nov 24, 1970 Tammy Wynette - "Sweet Dreams" Tammy Wynette - "He Loves Me All the Way" Ed Bruce - "Song for Ginny" Ed Bruce - "True Love's Forgiving" Buck Owens - "Johnny B. Goode" (edited out by RFD-TV) Buck Owens - "You're A Real Good Friend" Roy Clark - "Boil That Cabbage Down" Roy Clark, Grandpa Jones and Stringbean - "Charmin' Betsy"
Ray Charles, Lynda K. Lance and Doyle Holly Dec 1, 1970 Ray Charles - "You Don't Know Me" Ray Charles and Buck Owens - "Together Again" Lynda K. Lance sings "The World I Used to Know" Doyle Holly and the Buckaroos - "Feeling Good Is Easy, Baby" Buck Owens - "This Old House" Roy Clark - "Days of Sand and Shovels" The Hagers - "Hitchin' a Ride"
Waylon Jennings, Diana Trask and Johnny Duncan Dec 15, 1970 Waylon Jennings - "Kentucky Woman" Waylon Jennings - "Six Strings Away" Diana Trask - "All I Have to Offer You Is Me" Diana Trask - "I Fall to Pieces" Johnny Duncan - "Let Me Go" Buck Owens - "You Gotta Have a License" Buck Owens and son Buddy Alan Owens - "Bye-Bye Love" Roy Clark - "Alabama Jubliee" Roy Clark - "John Henry" The Hagers - "That's My Love"
Roy Rogers and Dale Evans Dec 29, 1970 Buck Owens and the whole Hee Haw Gang - "Rolling' In My Sweet Baby's Arms" Roy Rogers - "Lovenworth" The Hagers - "Palausa County Girl" Dale Evans - "Heavenly Sunshine" Roy Clark - "Nine Pound Hammer" Gordie Tapp - "Nobody's Singin' Them Cowboy Songs No More" Roy Clark - "Only Daddy That'll Walk The Line" Roy Rogers and Dale Evans - "Friendship Medley" Buck Owens - "I Wouldn't Live In New York City"
Charley Pride, Amanda Blake and Mickey Mantle Jan 5, 1971 Amanda Blake (of "Gunsmoke") - "Long Branch Blues." Amanda Blake and the Hagers - "Tennessee Waltz." Charley Pride - I'd Rather Love You." Charley Pride - "Sweet Promises." Buck Owens - "She'll Be Comin' Round the Mountain." Buck Owens - "Everything Reminds Me." Roy Clark - "Weakness in a Man" Cathy Baker - "Goober Peas." The Hagers - "Looney Cahoose"
Roger Miller, Peggy Little and Bobby Murcer Jan 12, 1971 Buck Owens and the whole Hee Haw Gang - "Love's Gonna Live Here" Roger Miller - "Dang Me" (introduced by the whole cast singing Roger Miller's song "King of the Road") Peggy Little - "I Wish I Didn't Have to Miss You" The Hagers - "Teach Your Children" The Nashville Edition - "Break My Mind" Peggy Little - "Statue of a Fool" Roger Miller - "That's the Way I Feel" Buck Owens - "Bridge Over Troubled Water"
Marty Robbins and Connie Smith Jan 19, 1971 Marty Robbins - "Beggin' to You." Marty Robbins - "I'll Have to Make Some Changes." Connie Smith - "Louisiana Man." Connie Smith - "I Never Once Stopped Loving You." Roy Clark - "White Lightnin'" The Hagers - "Flowers Need Sun, Too." Loretta Lynn, Bill Anderson, Susan Raye Feb 2, 1971 Buck Owens and the whole Hee Haw Gang - "Roll Out the Red Carpet" Loretta Lynn - "Coal Miner's Daughter" Bill Anderson - "Wild Weekend" Roy Clark - "January, April and Me" Loretta Lynn - "Secret Love" The Hagers - "Looking Out My Back Door" Susan Raye - "Willie Jones" Bill Anderson - "I Love You Drops" Buck Owens - "Homeward Bound"
Hank Williams Jr, Jody Miller Feb 16, 1971 Roy Clark and the whole Hee Haw gang - "Talk About A Party" Hank Williams Jr. - "Rainin' in My Heart" Jody Miller - "Look at Mine" Buck Owens and the Buckaroos - "Down in New Orleans" Cathy Baker - "Oh, Little Fishy" The Hagers - "100 Children" Jody Miller - "If You Think I Love You Now" Hank Williams Jr. - "Big Midnight Special" Buck Owens and the whole Hee Haw gang - "I Ain't Gonna Work (The Hippie Lament)"Sketches include several installments of "Dr. Campbell", "The Cornfield", "Moonshiners", "Samuel B. Sternwheeler", "Samples Sales", "Gordie's General Store", and "KORN News". Also, "The Culhanes", "Pfft, You Was Gone", "Pickin' and Grinnin'", "Hey Grandpa, What's for Supper", and Stringbean reads a letter from home.